You’ve worked so hard to make your property look its best, so why allow it to disappear under a veil of darkness? Artistically installed landscape and garden lighting can make your exterior spaces feel like an outdoor room filled with natural moonlight enhanced focal points. With a custom designed and professionally installed garden and landscape lighting plan by Outdoor Lighting Perspectives of Nashville, the fruits of your labor will not only shine in the darkness, but your outdoor living areas will come to life. 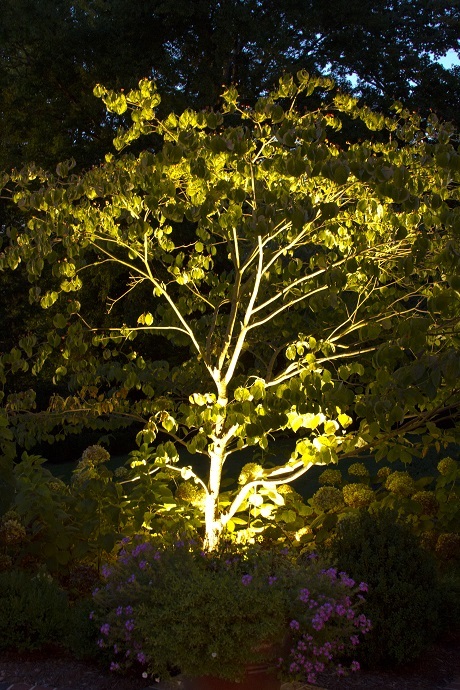 With the utmost care we provide exterior lighting designs which highlight your home’s landscaped surroundings, drawing special attention to prized plantings and trees. In the evening as colors seem richer and more vivid — lighting adds depth, texture and dimension not typically visible during the day. Imagine fragrant night-blooming jasmine glowing in the moonlight-like illumination of a path light as its small tubular blossoms permeate the night air with its exotic sweetness, or the papery silver-gray bark of the river birch appearing almost sterling as tree lighting accentuates and adds drama to its umbrella-like canopy of diamond-shaped, double-toothed leaves. 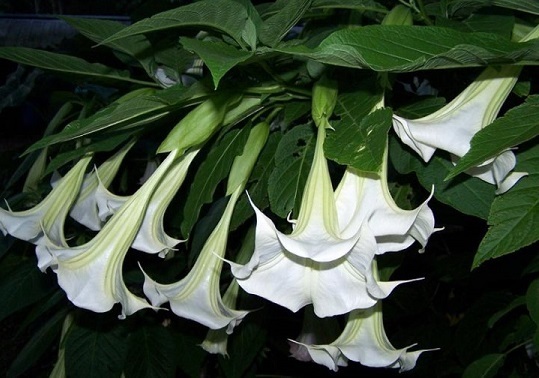 Night -blooming Brugmansia, aka Angels trumpet. Several night-blooming varieties of flowers and plants beg to be cast in the warm glow of landscape and garden lighting, for example: Brugmansia – a small tree with hanging flowers, Night Phlox – a bordering ground cover, Tuberose – opulent flowering bulbs, Japanese Wisteria – a woody vine with clusters of blossoms, and the fragrant Moonflower vine. No matter which type of foliage or floral displays your garden and its surrounding may contain, landscape and garden lighting intensifies their vibrant beauty…matched only by their intoxicating fragrances. Tree and landscape lighting on Royal Oaks in Belle Meade by Outdoor Lighting Perspectives of Nashville. Garden and landscape outdoor lighting is not only coveted for its aesthetic appeal but having a well-lit landscape will also enable you to utilize your property to its full potential. The amazing spaces you can create outside your home for enjoyment and entertaining with proper exterior lighting are almost endless. 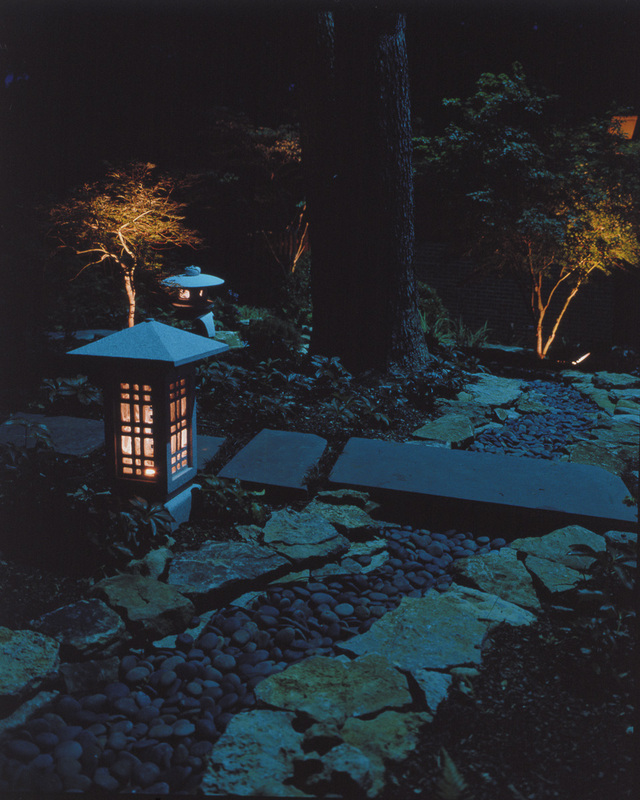 By filling dark shadows with warm light and spotlighting stepping stones and pathways, your garden and surrounding areas become your evening outdoor living environment casting an almost mystical spell upon its inhabitants. Add depth and mystery to your evening landscape. Make your yard safer for evening travel, while creating ambiance. Increase your home’s curb appeal. 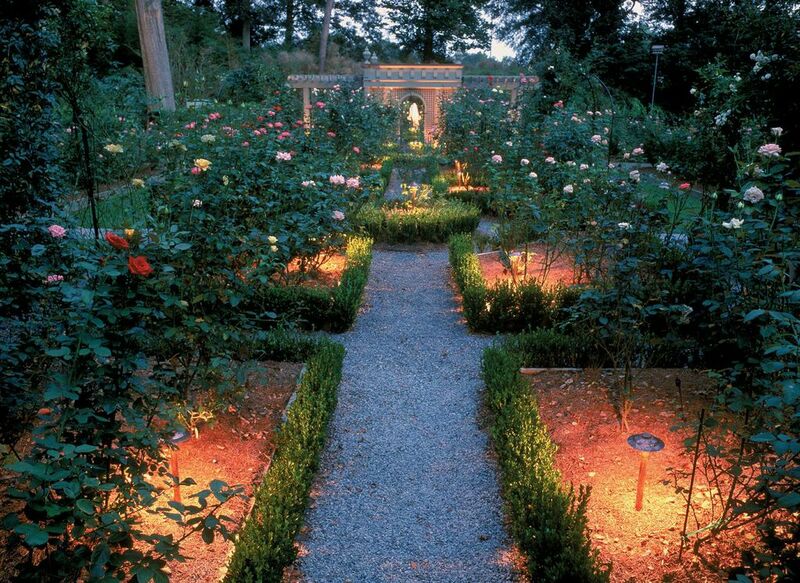 Choosing low-voltage landscape and garden lighting such as our LED lighting will save you money in operational costs. This entry was posted in Focal point outdoor lighting, Garden Lighting, Landscape Lighting, Nashville outdoor living, Outdoor Lighting and tagged architectural lighting, Garden lighting, How landscape lighting enhances every season in your Nashville landscape, Landscape Lighting, Nashville landscape and garden lighting, Nashville landscape lighting, Nashville LED outdoor lighting, Nashville lighting for night blooming perennials, Nashville night blooming flowers and plants, outdoor lighting Nashville, Outdoor Lighting Perspectives of Nashville, Tree and landscape lighting on Royal Oaks in Belle Meade by Outdoor Lighting Perspectives of Nashville by outdoorlightingnashville. Bookmark the permalink.